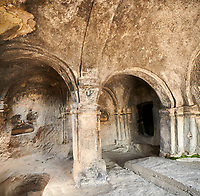 Pictures & images of Uplistsikhe (Lords Fortress) fortress cave city, near Gori, Shida Kartli, Georgia. 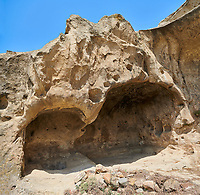 Situated in cliffs that run along side the Mtkvari River Uplistsikhe is an archaeological site composed of hundreds of cave dwellings, storage pits and caves. 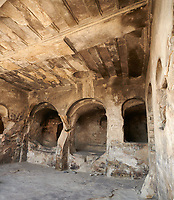 Dating from the early Iron age Uplistsikhe cave city was a religious centre by 1000 BC and an important trading centre by the 5th century BC. 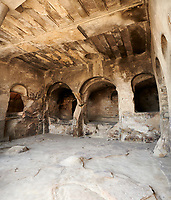 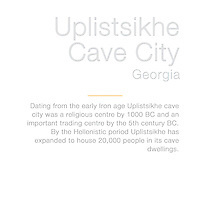 By the Hellenistic period Uplistsikhe has expanded to house 20,000 people in its cave dwellings. 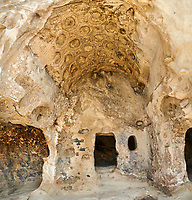 There are many other cave Halls at Uplistsikhe with similar interior decorations and even more that have no decoration at all. 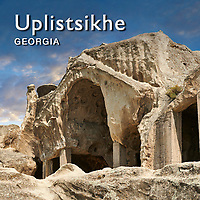 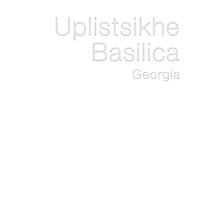 Uplistsikhe was in its heyday as far back as the 9th — 11th centuries AD when it was an important Christian centre with monasteries. 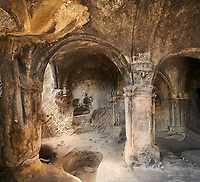 The cave complexes dating to high medieval times usually included a number of small hall-churches beside the dwellings. 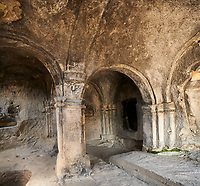 During the 13th century though 5000 monks were massacred at Uplistsikhe when it was over run by the Mongols. 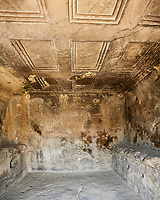 A three naive basilica survived on the site dating from that period and its interior frescoes were only whitewashed during the 19th century. 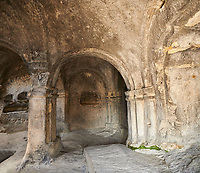 Download Picture & image of Uplistsikhe (Lords Fortress) fortress cave city, or buy as photo art prints on line.